It stinks! I'm not usually this heartless or blunt when it comes to the films I review. As someone who knows a thing or 2 about the practicalities of filmmaking, the blood sweat and tears necessarily to bring even the most modest project to fruition, I don't believe there's such a thing as a "lazy movie". The Biz is no place for those who can't go the distance and then some, and bringing any concept to the big-screen is a task of herculean proportions. That said, The Meg doesn't exist in a vacuum; it comes at a time when big-budget shark-themed horror movies are becoming a staple of summertime. Unfortunately, as opposed to the last couple years of stellar aquatic terrors, The Meg threatens to bring the trend to an abrupt extinction. Rather than turn this review into a laundry list of the film's shortcomings, I'll frame The Meg's failures in terms of other recent shark-themed horror movies successes, specifically 2016's The Shallows and 2017's 47 Meters Down. There's also something about The Meg that begs a comparison to Deep Blue Sea, so yes, I'll be going there as well. The Shallows and 47 Meters Down hooked their audiences with characters who were immediately relatable. Sure, the protagonists of both films are 20-something females, but horror fans are keenly tuned-in to the potential for danger lurking around every corner, even during vacations in paradise. We've all been giddy for adventure, propelled by the bravery of young adulthood and feelings of immortality, and movies like The Shallows and 47 Meters Down illustrate how everything can go to hell in a matter of minutes. We see ourselves in these everyday individuals who just happen to be in the wrong place at the wrong time. The Meg, on the other hand, is populated by 2-dimensional characters who aren't the slightest bit endearing (the sole exception being 8-year old Meiying, played by Shuya Sophia Cai). They even made Ruby Rose cold and uninteresting, and that itself is no easy task, as the DJ-turned-actress exudes natural charisma. We're in a state-of-the-art marine research facility surrounded by people who are the most intelligent eggheads in their fields. In other words: No one you or I have ever met in real life. Sure, this is similar to the character pool from Deep Blue Sea, but at least that film had recognizable archetypes. Thomas Jane was the Jock, Samuel L. Jackson was the stern corporate overseer, Michael Rapaport was the fool, L.L. Cool J was the every-man, and Saffron Burrows was (almost) the final girl. The Meg, on the other hand, has scientists A-E and each of them is completely interchangeable. Of course, great scripting can often breathe life into even the most uninspired roles, but The Meg has none (making the fact that the film boasts 3 screenwriters mind-boggling: You'd thing one of them could have come up with an emotional hook that actually held water). 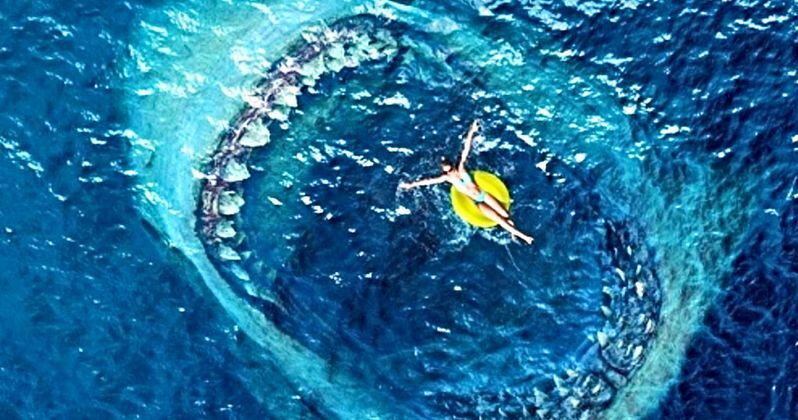 As opposed to The Shallows and 47 Meters Down, which lured moviegoers into the water one toe at a time, The Meg throws us in at the deep-end, opening with an explosive and claustrophobic sequence that definitely grabs us by the throat. But it honestly never gets more intense than these first few minutes. It's a reminder that moviegoers need to be eased into a story if filmmakers are trying to build towards something genuinely impactful. And even the best money shots of the titular Megalodon fall flat, owing to an overreliance on CGI combined with schizophrenic pacing that fails to deliver a single legitimate jump scare. Sure, we cheer for the shark when it jumps out of the water because it looks cool, but not because we've got been scared out of our seats. I have no doubt The Meg will satisfy those looking for lighthearted summer action, magnificent sets, and something the whole family can enjoy together. Horror fans hoping for The Shallows caliber thrills or something with 47 Meters Down's powerful twist, however, will be vastly disappointed. Compared to those films, The Meg lacks bite. The Meg is directed by Jon Turteltaub and stars Jason Statham, Bingbing Li, and Rainn Wilson. Can Crazy Rich Asians Swim Past The Meg at the Box Office?